I recently lost my mom, and would like to make each of the three grandchildren a remembrance item out of mom's clothing for Christmas this year. I'm not sure how much cotton she wore. I know people do pillows, but are there other ideas? Are there things you can do with jersey material as well as cotton? Or blue jeans? Or....what do people do? I am so sorry for your loss. I made a bear out of a child's jacket and it turn out nice. If the fabrics are not cotton then a stuffed animal is a good idea. I have saved a cotton night gown of my mother's that I want to do paper pieced sun dresses with it. I will make 3 blocks and turn them into mug rugs tor my sisters. Sorry for the loss of your mother! I made a pillow for my niece and nephew and a rag quilt for my sister in law from my brother's shirts. Memory pillows I make then and add a label that says. This is a shirt I used to wear when you hold it know that I am there. Love I used Papa on the last ones. You can add names or knick names etc. I have made several projects from my husband's shirts. You will be amazed how much fabric can be garnered from a shirt! The first projects were for our children and made into 38" wall hangings and several others that are smaller hangings using Dresden plates. This winter I made a queen size quilt for myself--and I still have the backs from the shirts waiting for another inspiration! Granted, these projects were "scrappy" but there is a lot of fabric in a shirt. I found most of his shirts were poly/cotton blend and a few were more "rayon" but I put everything in and it works. If you are contemplating jersey, I'd put a backing on that because it is so stretchy. I found the poly/cotton blends looked nicer as poly holds color better than straight cotton so still looks fresh in the recycling. Too,I think it is a stronger fiber. I've done bears as remembrance items very successfully. The problems with them arose when I found that the fabrics were basically cotton knits. I used fusible woven interfacing to stabilize each of the pieces of fabric I cut from the garments. After I cut the pattern pieces for the bears and got them sewn together, there was enough body to do the mouths using regular embroidery floss without any puckering. I used purchased bear eyes from a local craft store since these bears were for adults. I wish I could remember what kind of woven interfacing I used. The brand name escapes me, but I know I need another bolt or two for t-shirt quilts in the near future. I was also going to say stuffies out of your mom's clothes would be sweet. Especially for kids. Dogs, bears, cats, whatever animals they like. Very sorry for your loss, Red. A friend gave me a flowery T-shirt and a pair of soft denim pants her mother wore. I cut them into squares and made a simple quilt. So sorry for your loss. In my own humble opinion you can put anything in a crazy quilt or pillow. I know because I have. You just need some stabilizers for the knits or lighter weight fabrics. A family friend made bears out of two of my dad's flannel shirts. She used details like the collars and button placket. Each is different. I got the one with the repair patch. She machine embroidered his initials on the bears foot. I made aprons from a friend's mom's polyester/silky blouses, jeans and cotton shirts. Also made pillows dad's shirts. I've made several remembrance quilts. There was not a lot of cotton involved! I used a stabilizer on the back on most pieces, very similar to the way t-shirts quilts are made. I think most of these quilts are decorative and aren't used like a traditional quilt. They are great conversation starters and bring up so many memories. I didn't do anything with clothes but I did take some of my Mom's Christmas tree ornaments and made wreaths for myself and my two children. I have to say they turned out beautiful. 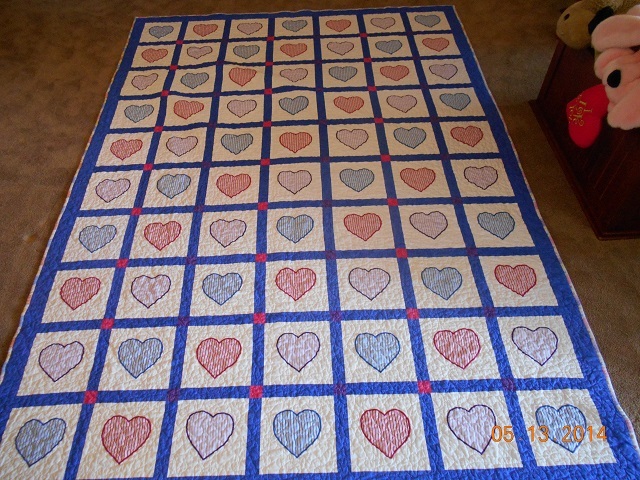 My nephew's mother in law made him this quilt using his mother's pajamas for the appliqued hearts. You could use just about any kind of fabric for the hearts. My best friend used the jackets of her co-grandparent. She cut our the designs and put them on fabric and made pillows for the family. Of course, the co-grandmother had made the designs by painting on the jackets; she was a talented artist. I wanted to do something similar for my relatives after my Mom and Dad passed. I'm using a circle fussy cut from one of my Mom's shirts (she loved ones with emblishements) and a square of 2" squares cut from my Dad's striped shirts. The are part of the label that is going on the back of each quilt. With 10 siblings and over 25 grand children, there was not enough clothing to do anything using a lot on the front of the quilt. I’ve done several ornaments out of clothing. If I knew how to post a picture I would. im the only quilter in the family, so when dad passed away I was able to use a lot of his clothing items in a quilt. I had quite a mix of fabrics, cotton, poly cotton, jersey, flannelette, silk ties, gaberdene trousers, towelling, woollen scarves and more. Using vilene (can't remember the new name for it) made a difference on the stretchy fabrics, however it was still difficult combining the different fabrics in some of the blocks I chose to make, but I'm very pleased with the whole look of the quilt and would make another one with different fabrics again. [QUOTE=youngduncan;8060796]I've done bears as remembrance items very successfully. The problems with them arose when I found that the fabrics were basically cotton knits. I used fusible woven interfacing to stabilize each of the pieces of fabric I cut from the garments. After I cut the pattern pieces for the bears and got them sewn together, there was enough body to do the mouths using regular embroidery floss without any puckering. I used purchased bear eyes from a local craft store since these bears were for adults. I have seen Dogs in Sweaters” ( by Elizabeth Hartman). quilts and throws using clothing as the sweaters. I thought that was brilliant.